Make your own volcano and watch it erupt. Includes plaster, mold, paint, brush and stir stick. Make your own volcano and watch as it erupts with bubbling, fizzing "lava". 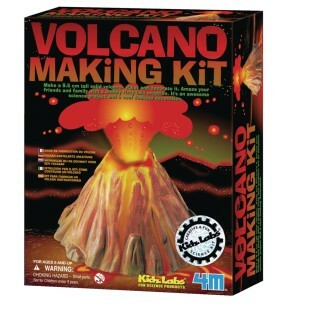 Kit includes fast-drying plaster, volcano mold, paint, paint brush and stir stick. Requires baking soda and vinegar for eruption, not included. used the volcano at a luau party for elementary kids. used it to show how Hawaii was formed in a fun way. used it in conjunction with a mentos geyser.